in order to discover things not seen, hiding themselves under the shadow of natural objects, and to fix them with the hand, presenting to plain sight what does not actually exist." It's frustrating when we have an idea in our head, but can't make it appear on the paper how we want it. When watercolor painting works, it's like magic. When it doesn't, it's hard to know exactly when things went wrong and how to fix them. 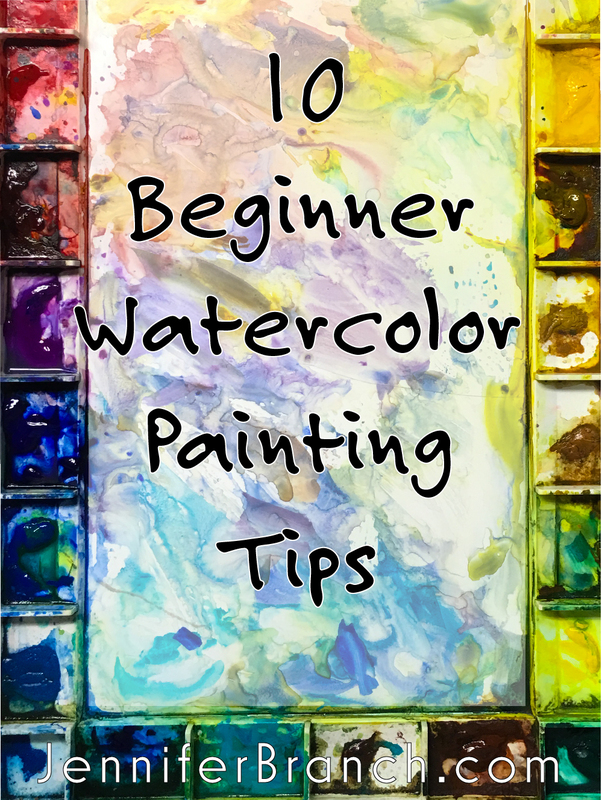 Sometimes learning to paint seems overwhelming, but just a few simple changes can make it so much easier. Remember, when you're looking at an artist's work you admire, those paintings are the best of his or her lifetime and took a lifetime to learn to paint. 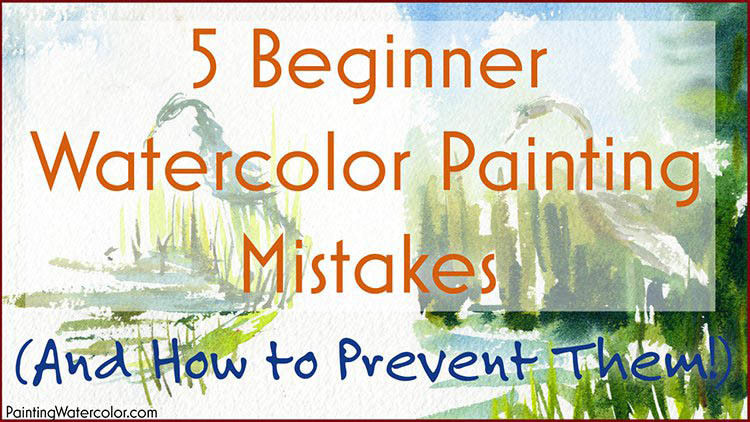 That doesn't mean you won't paint your first great painting this year! It just means be patient and kind to yourself. 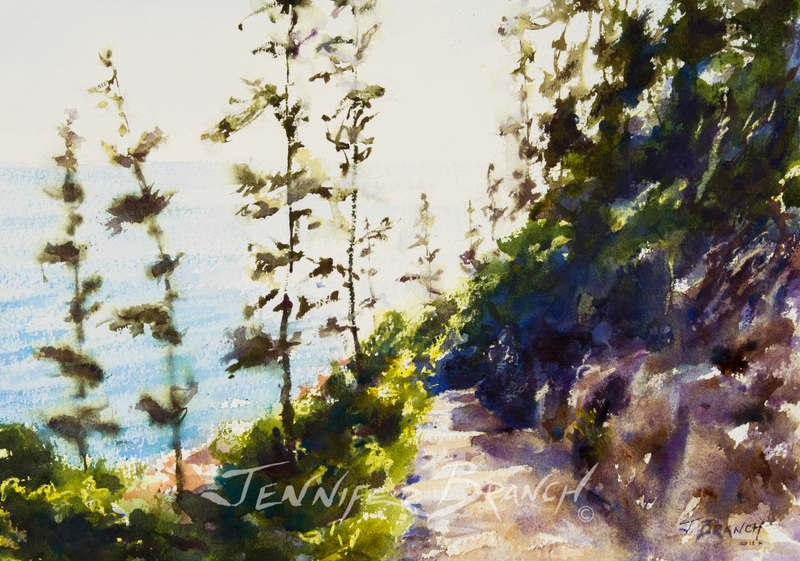 As you paint more, it becomes easier and easier to put what's in your head on the paper. 1. Look at what you're painting! This seems so obvious, but very few people look at things. That's what being an artist is - really looking at the world around you and showing other people what you see. 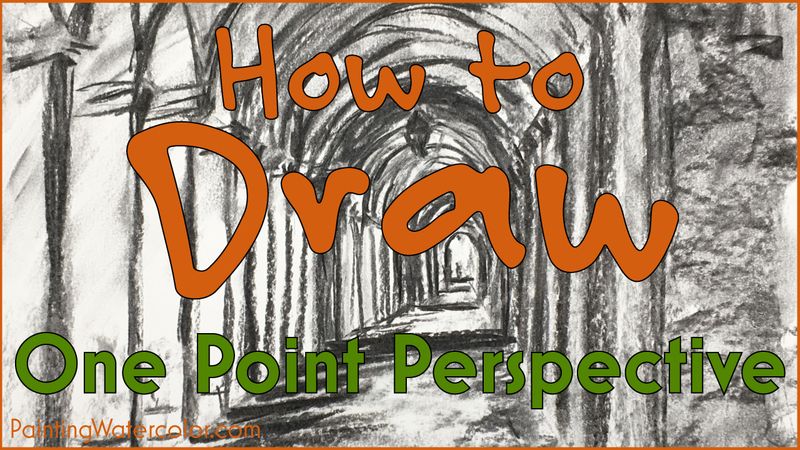 I see students in front of a beautiful view that they draw meticulously, barely looking at it. Fifteen minutes can go by before they glance at their subject, once they start painting. Of course their painting won't have the feel of their subject. How could it? 90% of a painting happens in my head, while I'm looking at my inspiration. The mechanics of painting are simple, but what's in your head is difficult! Seriously, look at what you're painting! Sketch it in pencil and watercolor, think about it. The reason that there is no point in "how to paint clouds, or water, or portraits," is that every cloud, every lake, every person is completely different depending on the light, the season, the mood. 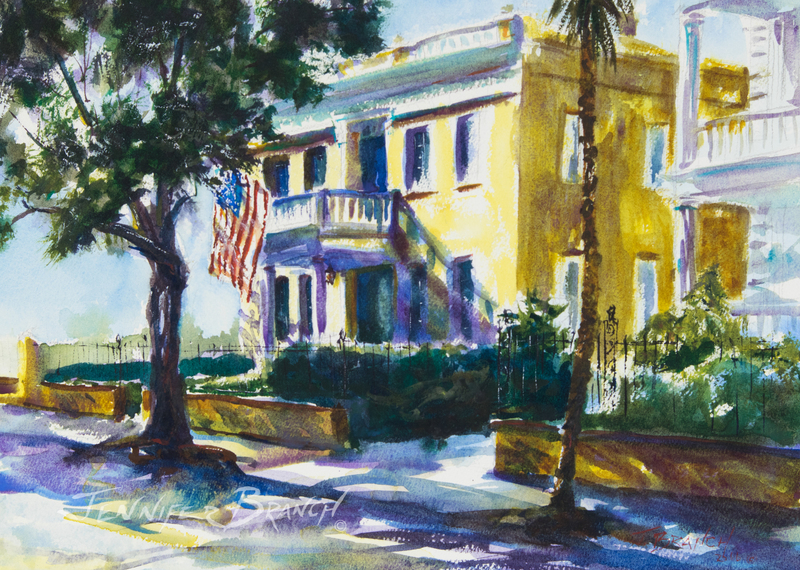 Painting subjects continually change and as artists we must change with them. Study lots of different artists you admire and how they paint all sorts of things. A lesson on clouds might inspire your painting of ocean surf. The shadows in a still life might lead to a new idea on street shadows. Who knows what lessons will inspire? Your first inspiration must always be your subject. Look at it! 2. 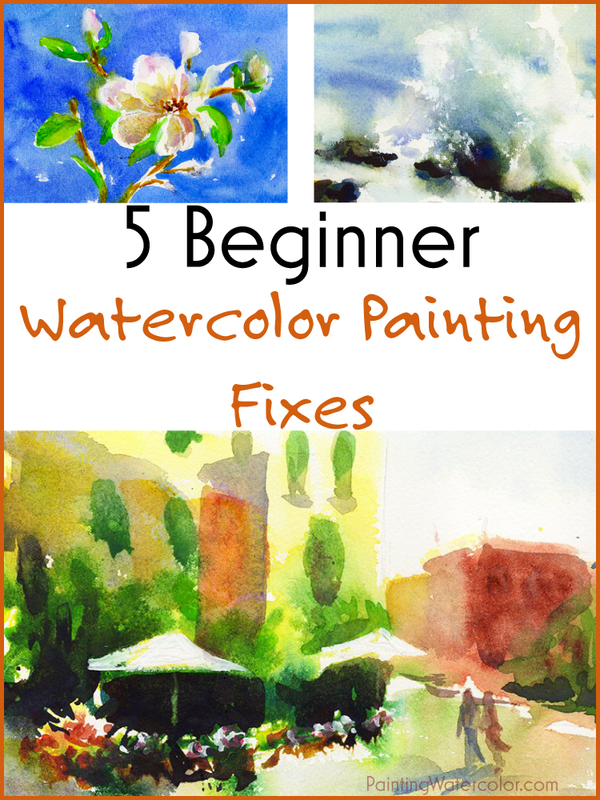 Use a big brush and work on the entire painting at once. Start with at least an approximately 10" x 14" sheet of paper and a #14 Round brush. I'm a big fan of tiny sketchbooks you can carry around everywhere, but not for the first 10 paintings or so. And keep the same proportions. Tiny sketchbook with a #8 brush, etc. Don't choke up on your brush. Use your arm, not your hand. The big picture is much more important than tiny details. 3. Leave lots of white paper. By lots I mean 50% of your painting is still white paper after the first wash. It's a waste of your time and your money otherwise. Student grade paint and paper are almost impossible to learn to paint with. You can do it, but it's going to be harder. Student watercolor paint is mostly kaolin, a clay filler, not pigment. So unless you are an accomplished painter, you're going to end up with a lot of mud in your painting. You're painting with mud so you end up with muddy paintings. Student grade paper is such poor quality it pills up and puddles on the first wash. This means it's very difficult to get the multiple washes you need to do to get intense colors. 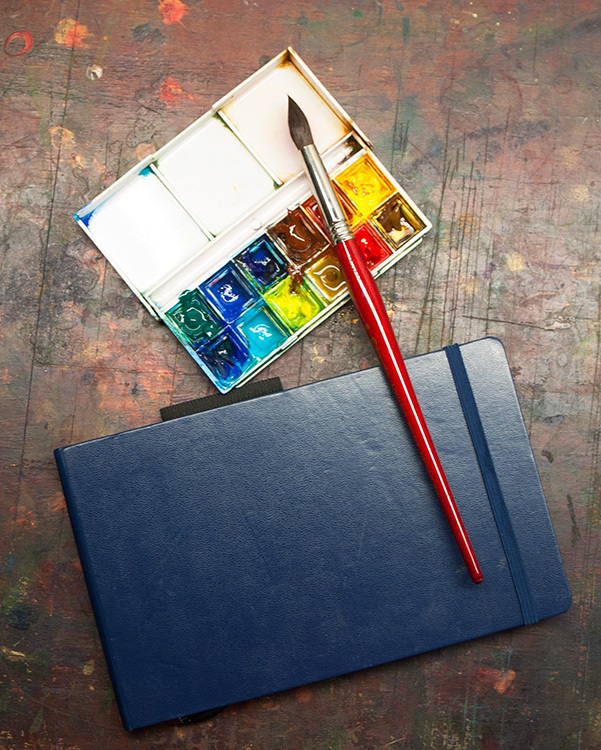 Bad art supplies make student artists so frustrated that often they just give up, thinking they can't paint. So often, they're just let down by their materials. Good learning materials are not usually the most expensive. You can find good art supplies at reasonable prices. Your time is worth it. 5. Learn to draw easily. This was one of the hardest parts for me! I love painting but pencil sketching bored me. So I decided I needed to force myself to draw a lot. I sold pen and ink sketches of people's houses through high school and college. A lot of drawing is involved in that. Houses have to be in absolutely correct proportions. People notice if the door is bigger than the roof! Once you can draw houses accurately, you can draw anything. 6. Painting (and drawing) people is just like painting a landscape. Portraits are no more difficult (or easy) than anything else if you can get them to hold still for a few minutes. Don't be intimidated by a subject. Approach everything with confidence and enthusiasm. A few minutes is all you get for the light to stay the same on a landscape. 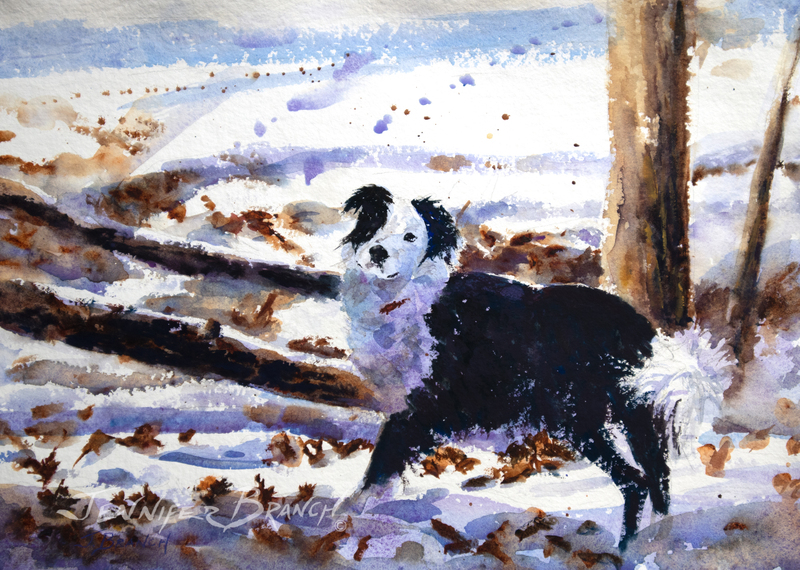 Watercolor painting tutorial of my dog playing in the snow. I definitely needed my camera to capture his brief pause! 7. Work fast and take a photo before you begin. Light constantly changes. You don't want to forget the moment that inspired you when the child moves or the sun's covered by a cloud. 8. Ignore any "tips" on "finding your style." Nothing will prevent you from finding your own unique, wonderful style than actively seeking it. Go ahead, copy from your favorite artists until you master techniques. Copy and try all sorts of styles from many different artists you admire. The really amazing thing about painting style is you will merge all those styles into your own unique style. Your own true style will develop without actively seeking it. Actively seeking your "artistic" style results in poor technique - which is the foundation for a style. When you're beginning, concentrate on getting what's in your head on the paper. Your goal should be great art that is true to yourself, not being "artistic." Trust me, your own unique style will be better than you could ever imagine if you don't try to force it into a mold. 9. Don't expect to paint a really good painting until you've painted at least 100. Of course, you'll generally see something you like before then! 10. Have fun and paint a lot! How can we expect the world to find joy in our art if we don't? Enjoy every step of the way. I hope you find joy in painting! Sketch something every day for a month. 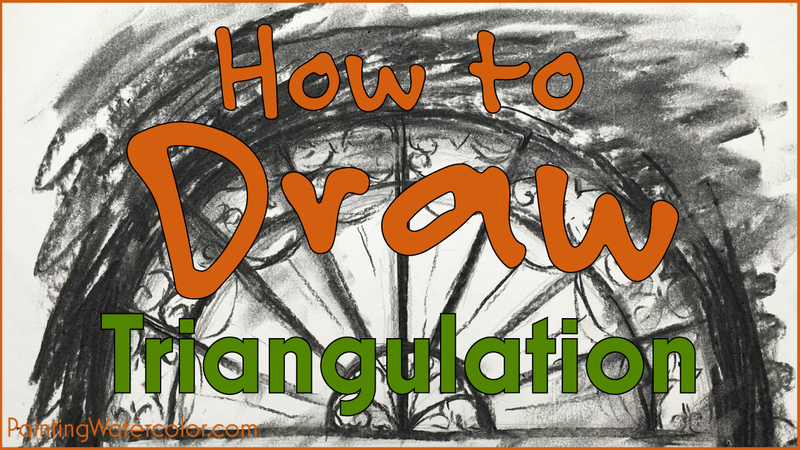 Don't agonize over each drawing, spend a maximum of 5 minutes each. More than that because hard to keep up. A month is long enough to build a habit of sketching. You'll be surprised at how much you've improved in 30 days of sketching, 5 minutes a day. Do this looking at a sunset. Use 3 colors on each wash, 2 washes total. Let the paint dry between the 2 washes. Use this as an opportunity to really look at the colors in the sky and play with paint. There's not much drawing involved, just painting, so a sunset is a chance to explore color like crazy!